Whatever your fitness goals are, push-ups should be a part of your regular workout routine. Push-ups are the ultimate exercise--they engage muscles throughout your entire body and can be performed in a short amount of time almost anywhere without special equipment or assistance. But like any exercise, to get the most out of it you have to do them the right way every time. Follow these four simple steps and you'll be performing perfect push-ups in no time. Starting on your hands and knees, find a comfortable place for your hands and feet. You don't want distractions like rocks in your hands or uneven footing to keep you from proper form. 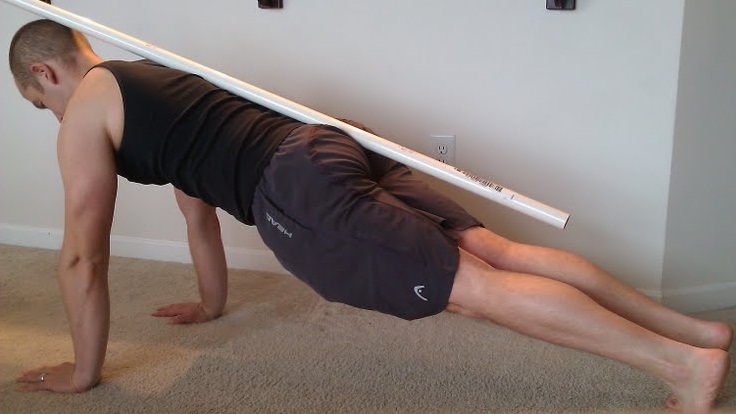 There are many variations to push-ups incorporating inclines that can be implemented into your routine as your ability progresses, but starting out you will want to find as level a place as possible to perform the exercise. Once you are in a comfortable position, push up so that your weight is being supported by your hands and toes. Your arms should be straight, but not locked, and your hands should be shoulder-width apart. Your legs should be straight as well, and your feet close together (but no more than twelve inches apart). Hold the position for a moment and concentrate on your form. Straighten your back so that your entire body creates a straight line from the base of your skull to your heels. It's important to maintain this straight line throughout your workout. Looking down instead of looking forward throughout the workout will help you maintain this proper form. Take a deep breath in and continue to hold your body as one unit as you lower yourself towards the ground. Do not allow yourself to just drop; lower your body in one controlled motion. 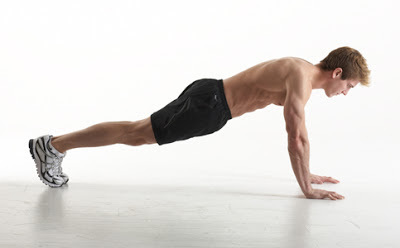 For your push-up to be effective, you should lower yourself to the point where your body almost touches the ground. When you first begin working on form, it may be necessary to have a workout partner who can give you feedback as you do each push-up. Eventually this will become unnecessary as you get a feel for what a correct push-up feels like. Exhale and push up with the same controlled motion you used to lower yourself. 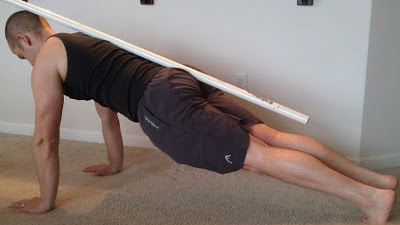 If you are a beginner wanting to incorporate push-ups into your routine, there are various alternative exercises that can help you "work up" to push-ups. Consider pushing up on a set of stairs (feet on the bottom level, hands on a stair at shoulder height) or performing push-ups on your knees after you've attempted proper push-ups. You might also consider working through the first two steps of a perfect push-up--getting into the proper push-up form--then holding it until you reach muscle failure. - Tuck Your Elbows. If you took a bird’s eye view picture of your body, and your uppers arms are forming a “T” with your torso, then your form is not correct and you are putting too much pressure on your shoulders. Instead try to keep your elbows tucked and close to your body. Think of pushing through your armpit, and this way you will involve your chest, triceps and back, while protecting your shoulders. - Push Your Abs Out. Imagine that someone is going to punch you in the stomach and push your abs out. - Squeeze Your Glutes. While pushing the abs out, also squeeze your glutes hard. These 2 small tricks will help you keep your back straight and avoid any hyper-extension of the lower back. - Keep A Neutral Spine. Your neck must stay in line with your spine (neutral spine). Imagine having a stick on your back which should be in contact with your body in 3 points! (your head, your upper back and your coccyx – see the image above). You can learn more about the “Neutral Spine” in this video. Don't be intimidated by the push-up. It is a difficult exercise, but if you are physically capable of performing push-ups, then age or gender shouldn't keep you from making them part of your workout routine.